When you see all of the new businesses, clean buildings and young professionals hurrying from work to play, it is hard to believe that Silver Spring, Maryland was considered something of a wasteland of abandoned urban sprawl only a short decade ago. Silver Spring is a true success story of urban renewal that now offers area residents a community that they can be proud of with housing that ranges from the affordable, comfortable apartments to high end, luxury condominiums. While residents of the outer suburbs sit all morning and evening in bumper to bumper traffic, many Silver Spring citizens find that they can live perfectly comfortably without even needing an automobile due to reliable public bus transportation of the county and city, a convenient Metro station and successful car sharing programs like Zip Car. 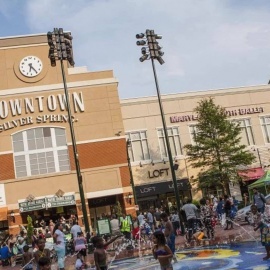 With the major influx of new wealth and young residents, it is no surprise that Silver Spring has no shortage of shopping, dining and entertainment options. The majority of commerce is centered around the Downtown Silver Spring Shopping Area, where great restaurants such as Capital Bleu and Lebanese Taverna Cafe sit side by side with lively local watering holds like Lenox and Hook and Ladder Brewing company. The adjacent shopping mall offers convenient retail shopping for standard fare, while the outlying boutiques and specialty shops offer more specialized items. For entertainment, there are two major movie theaters nearby, including the Majestic and the famous Silver Theatre of the American Film Institute, as well as theatrical stages like Round House Theatre and Montgomery College Performing Arts Center. Come enjoy painting, drinking, networking and great conversations with "Strawberri Lemoade Podcast." Come experienceDAYGLO - FOREVER 90'S BRUNCH Edition.Step out of your ordanary and Step into the 90's.FeaturingDj Super SliceDj G-Nice Sprang International Blasting 90's Reggae | Soca | Hip Hop + More! "Dragon Lair" is an original story ballet showcasing the many talents of the Ballet Academy and PARC BELTSVILLE dancers in a wonderful theatrical production with imaginative costumes, scenery, lighting and a ? of course!